Warner Bros.' Shazam got off to a hot start last weekend with over $150M worldwide, giving DC Films its second straight hit following the success of Aquaman. While there are other DCEU films on the horizon, such as Wonder Woman 1984 and Birds of Prey, one that has been in the works for a solid decade is deeply-connected to Shazam and that's Black Adam, which has long had Dwayne Johnson attached. “We were trying to tell two origin stories in one script…Shazam is connected to Black Adam. 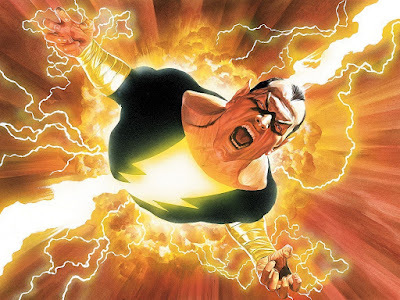 Black Adam is an anti-hero or villain, who I cannot wait to play. I’ve been developing this, and it’s been with me in my DNA for over 10 years, now. We should start shooting that in about a year. Very excited about that." Next year, huh? We'll see. Then again if Shazam proves sturdy at the box office it should give Warner Bros. the confidence needed to move forward on Black Adam. I'm doubtful the character can carry a movie by himself, but I have no doubts Johnson can put asses in seats.